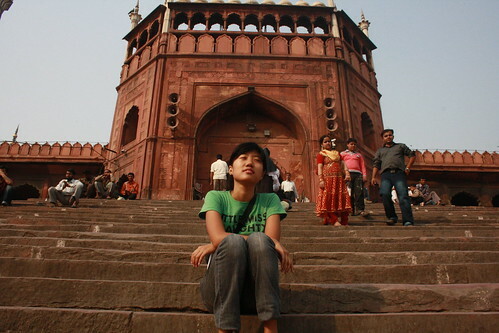 On her own in Old Delhi. Is Phebe Bay, a 20-year-old girl from Singapore, unusually adventurous? 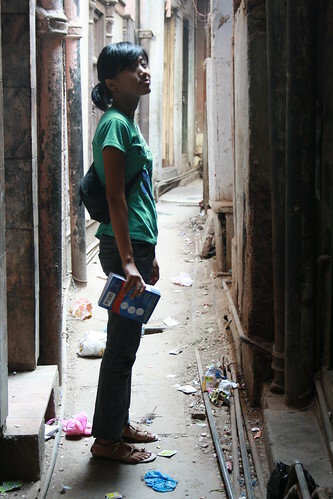 This management intern in Gurgaon does what most girls of this city rarely dare: walking in Old Delhi bylanes, alone. 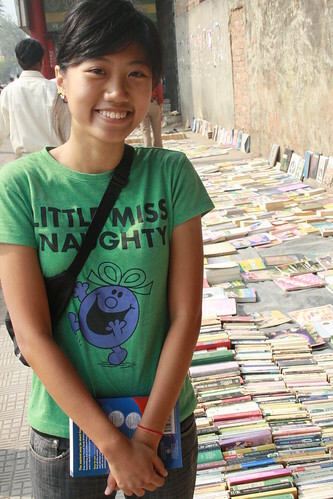 Just four months in the Capital and Ms Bay has seen more of Shahjahanabad – another name for the Walled City – than most English-speaking, jeans-wearing Delhi girls of her age. Eating shami kebabs in Matia Mahal bazaar and jalebis in Chandni Chowk, sight-seeing in Jama Masjid, buying books in Daryaganj, strolling aimlessly in Turkman Gate alleys… She has done all that. On her own. Ms Bay speaks only three Hindustani words – Kitna, Namaste, Shukriya. Is it wise to be alone in the Walled City when you don’t even understand the local language? Isn’t Old Delhi culturally too conservative? Is it Ok to go there in jeans and T-shirt, not the most popular women wear in that part of the city? What about the ogling men? Is Ms Bay too brave? Most Delhi girls don’t go there. Not alone. Do the men stare at her? Any nasty experience? What does she do then? Why not limit excursions to less risky south Delhi? Considering she is from Singapore where spitting chewing gum on the road is a crime, doesn’t she get horrified by Old Delhi’s insanitary filth? Just then a bike honks past her. What does she think of Gurgaon? Aren’t the malls of that Delhi suburb truly world-class? 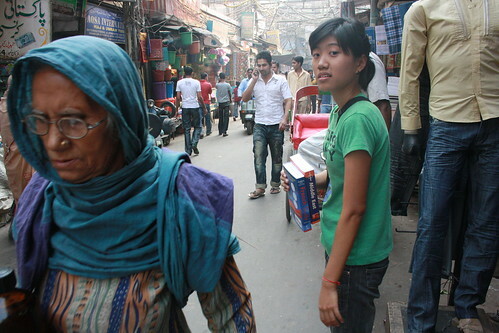 Is there anything about Old Delhi that really bugs her? Talking of transport, how does she commute? Click here to read Ms Phebe’s hard talk with Delhiwallas. Special Feature – Why is Old Delhi So Dirty? This is disheartening! How many women have been raped in walled city as compared to other ‘POSH & PLUSH’ localities of Delhi? Women might be stared and commented upon but they are as safe as a house here. Get your facts right Soofi bhai. This is really really really very heart wrecking! I have to say, the girl got guts. Is the piece trying to give a hint that Old Delhi men, especially, are sort of lech? That wasn’t my intention. I just wanted to bring out the false stereotypes that many Delhiwallas living outside of Old Delhi have for this part of our city and how it fell on a foreigner to rip apart those falsehoods. And yes, while we talked about it, it was wise to realise that the touristy Shahjanabad doesn’t boast of clean toilets! I never imagined that you’d reply Soofi Bhai. But good to see that you responsed. Although, you turned the tables over once again. I can write reams and reams about the ill treatment that Old Dilli (Delhi) gets, but…Yeh kahani phir kabhi. This girl is so courageous! I spent a year in Gurgaon and never ventured beyond the narrow lanes of Chadni Chowk. Not that I didn’t want to – after reading the City of Djiins all I wanted to do is jump on a rickshaw and go explore old Delhi. Of course, I was warned it is not safe. Although Gurgaon was not safe either. To be honest, based on my personal experience, a lot more eve-teasing happens in Old Delhi than in other parts of Delhi. That could be the reason why most women feel unsafe to walk around there. 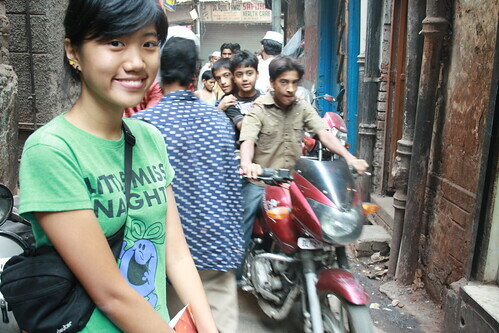 Prior to this post, I must say I never knew Delhites perceptions of Old Delhi – that it was unsafe for girls. And why is jeans and T-shirt not the most popular woman wear in the city? I have worn those on numerous occasions. People stare a lot, but it is not a problem. When I first came to Chandni Chowk, I was shaken by the noise, heat and dust. But a few more trips later, I got used to it. It started to feel like I was walking in a Chinatown or a Little India in Singapore. Not the cleanest of all places, but some of the most interesting and beautiful. And one helpful hint before going to Old Delhi – Try to drink as little water as possible!